I didn’t play last Thursday (had to take a bye), so I decided to post a correspondence chess game that I won recently. It’s a thematic Ruy Lopez tournament, I was Black and played Marshall attack, here is the game. I would define Marshall attack as “fast and furious” and I think I was able to follow that definition in this game. White’s move 16. Nd2 was too slow, allowing 16… f5 and 17… f4, and then a mistake let Black to make a typical sacrifice. White’s 25. Bf4 was the best, still losing an exchange and getting into the lost endgame. This position is from one of my blitz games. I am Black. Imagine that you are a gladiator, your opponent lost and you see thumbs down – the public wants him dead. How would you finish him off? Black to move (the answer is here). It is not a fantasy :), I defeated an expert in Caro-Kann, fantasy variation, delivering a Boden’s mate after rook sacrifice on move 23. Here is the game, I was White. It was the same guy a drew a few months ago with him having 30 seconds left on the clock. After some struggle where I never was worse, we came to a position, where I had some pressure and two bishops. After 21. Rxd6 I noticed that if the knight won’t be on e5, there is a possibility of Boden’s mate (mate with two bishops, I remembered the pattern, not the name at that moment). 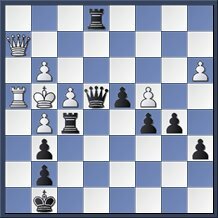 Still it was a bit of shock when he played 22…Nf7. I checked again and played 22. Rxc6+, he resigned. He was very nice afterwards (as during/after our first game), not only doing post-mortem, but also showing a few guys how he got mated. If not this combination, I planned to use my two bishops (don’t know if I would succeed), Fritz gave me half a pawn advantage.